Figure 4 Upper Old Red Sandstone conglomerate and sandstone resting unconformably on south-east-dipping Arbroath Sandstone of the Garvock Group, Lower Old Red Sandstone. N end of Arbroath Promenade. Figure 5 Garron Point and Craigeven Bay, Stonehaven. The rocks in the foreground and on the point in the distance are largely sheared spilitic lavas belonging to the Highland Border Complex. The pinnacle left of centre is composed of carbonated serpentine 'fault rock' on the line of the Highland Boundary Fault. To the left are slightly metamorphosed greywackes of the Dalradian Southern Highland Group. Route maps (Map 3), (Map 4). Walking distance Arbroath, 1 km; Crawton, 1 km; Stonehaven 5 km; all on rocky shore. 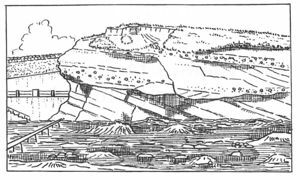 Purpose To examine the following: (1) rocks of the Upper Old Red Sandstone and their unconformable relationship to the Lower Old Red Sandstone; (2) some of the Lower Old Red Sandstone rocks of Kincardineshire, particularly the Crawton Basalts, the Downie Point Conglomerate and the Pridolian (late Silurian) Stonehaven Group rocks at Stonehaven; (3) the Highland Boundary Fault and rocks of the Highland Border Complex at Stonehaven. Structurally the route starts on the south-east side of the Sidlaw Anticline, a NE–SW trending structure of Middle Devonian age. This is gradually crossed and beyond Montrose the rocks form part of the parallel Strathmore Syncline. At Stonehaven the steeply dipping north-west limb of this syncline is met where it abuts against the Highland Boundary Fault. Beyond that lie rocks of the Highland Border Complex and the Dalradian metamorphic rocks of the Scottish Highlands. Route Starting from Dundee travel along A92 to Arbroath. This route crosses gently undulating farmland underlain by Lower Old Red Sandstone sediments and lavas belonging tothe Arbuthnott and Garvock Groups. On reaching Arbroath pass north-east through the town to the promenade and continue along this to the far end [NO 658 411]. In the cliff at the back of the beach red sandstones and conglomerates of the Upper Old Red Sandstone unconformably overlie red sandstones of the Garvock Group Arbroath Sandstone (Armstrong and Paterson 1970, p. 15). The latter are fine to coarse-grained, pebbly, cross-bedded and with mud-flake conglomerates and belong to the Lower Old Red Sandstone. The line of unconformity can be traced north-east along the cliff for 250 m until at the north end the Upper Old Red Sandstone can be seen to be banked against a cliff of Lower Old Red Sandstone. Armstrong et al. (1985, p. 51) have deduced a relief of 100 m in the pre-Upper Old Red Sandstone land surface. Within the Upper Old Red Sandstone other sedimentary structures can be seen to advantage. Ramos and Friend (1982, p. 313) believe these to be alluvial plain deposits. A poorly developed cornstone affecting a conglomerate penetrates the unconformity and has developed a network of carbonate veins in the Arbroath Sandstone beneath. The inclination of the Upper Old Red Sandstone is very gentle (10° ESE) while that of the Lower Old Red Sandstone is 15° to 25° SE (Figure 4). No fossils have been obtained from the Upper Old Red Sandstone and the beds are assigned to this period on lithological grounds only, resembling as they do the fossiliferous Upper Old Red Sandstone of the Carse of Gowrie (Armstrong et al. 1985, p. 51). Take the bus north from Arbroath along A92 across very poorly exposed Lower Old Red Sandstone sediments. At Inverkeilor the road rises steeply onto the Ferryden Lavas of the Montrose Volcanic Formation within the Arbuthnott Group. These form higher ground which extends north-east along the strike to the coast just south of Montrose. The low ground of the Montrose Basin is occupied by Quaternary clays and alluvium. These overlie Upper Old Red Sandstone sediments occupying a depression in the unconformity surface over the Lower Old Red Sandstone. Continue north beyond Montrose on A92 until 9 km north of Inverbervie and then at [NO 873 810] take the unclassified road that runs for 1 km south-east to the car park at Crawton Farm on the coast [NO 879 798]. At Crawton follow the track that continues south from the end of the road down to the old raised beach cliff. Notice the fine storm beach of boulders derived from the Old Red Sandstone conglomerate. On the west side of Crawton Bay this conglomerate, at the base of the Arbuthnott Group, forms a sheer cliff 30 m high with boulders up to 75 cm in diameter. Well rounded quartzite is the commonest constituent, but boulders of various granites and lavas, including the Crawton Basalts, also occur, together with greywacke, jasper and 'greenstone' probably from the Highland Border Complex. In a traverse eastwards along the shore four successive lavas are crossed, the Crawton Basalts. The tops of these flows are highly vesicular and slaggy and the bottoms less so. Sandstone veins penetrate the lavas whose tops are usually weathered, eroded and uneven with the intervening conglomerates lying in hollows on their surfaces. The basalts and the underlying conglomerates belong to the Crawton Group of the Lower Old Red Sandstone and they all dip west into the Strathmore Syncline at about 15° (Armstrong and Paterson 1970, p. 9). The flows are of porphyritic olivine-basalt with unusually large tabular plagioclase feldspar phenocrysts up to 2.5 cm across; these have a strong, flow-banded, parallel orientation thus giving the rock the platy habit characteristic of the Craw-ton Basalts. At this locality, beside the major NW–SE joint shown on the map, the lowest flow weathers in an unusual manner, the centres of the columns wearing away while the margins stand up to produce a honeycomb rock surface. Campbell (1913, p. 940) believed this to be due to silicification along the joints. The lowest flow also contains exceptionally large amygdales up to 15 cm across. These contain chalcedony, clear quartz, amethyst and calcite. The base of only the lowest flow is clearly exposed and at this locality, which is reached by crossing the gully at locality 4, it is seen to rest on a fairly flat sandstone surface over the conglomerate, with local irregularities. The conglomerate contains a wide variety of rock types in boulders up to 1.8 m in diameter. These include mica-schist, gneisses, schistose grits, quartzite, vein quartz, jasper, pink and grey granites, 'felsite', 'basalt', sandstone and grit. Clast imbrication and cross bedding have been used by Haughton (1988) to demonstrate a southerly and easterly source for much of the Crawton Group conglomerates along the coast. The source area was composed mainly of turbidites cut by calc-alkaline plutonic rocks. On returning to the top of the cliff observe on the shore opposite Crawton Farm a small inlet with vertical sides called Trollochy. A series of closely-spaced E–W vertical faults can be seen at the west end of this inlet and on looking across it from the south side sheared pebbles can be seen on the north face. It is thus apparent that the inlet is due to differential erosion along the faults. The net downthrow is small and to the south – with the eye follow the base of the lava along the cliff. Descend to the head of the inlet where the contact between the base of the First Crawton Basalt and the underlying sediment can be examined. The underlying mudstones are slightly thermally metamorphosed and locally they have been squeezed up into the lava. A small stream flows over the north edge of the inlet. This is a postglacial stream course, the old course, now filled with till, being apparent 60 m further west. It lay along the line of the prominent NW–SE joint traversing both the conglomerates and the lavas. A blow hole is occasionally active on it at high spring tides. Continue northwards along A92 and, for the last 1.5 km, A957 to Stonehaven; take the bus down to the harbour and continue eastwards on foot to Downie Point [NO 881 851]. 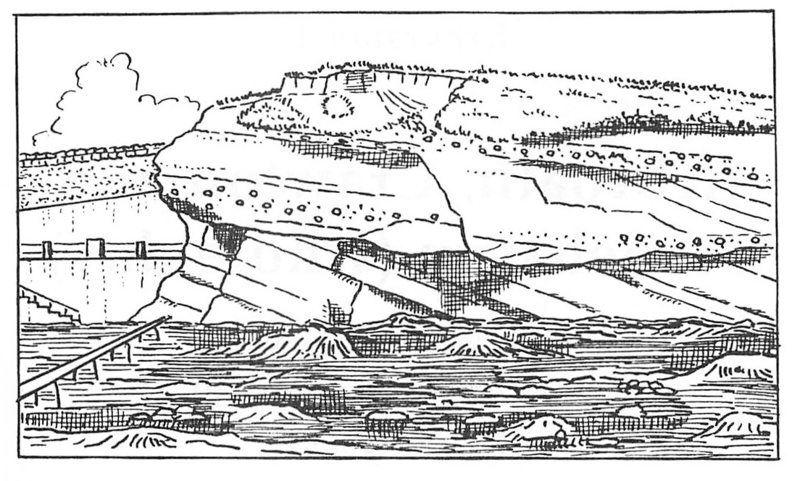 The headland is composed of conglomerate at the base of the Dunnottar Group of the Lower Old Red Sandstone (Armstrong and Paterson 1970, p. 7), the Downie Point Conglomerate. It is cut by large joints and is one of Campbell's (1913) 'highland conglomerates', with boulders of meta-quartzite predominating, but accompanied by granites, porphyries, rhyolites and andesites. It is about 170 m thick and has a few impersistent grit bands. The dip is vertical and the top faces south-east, i.e. it lies on the north-western limb of the Strathmore syncline. To the south the conglomerate is succeeded by grey tuffaceous sandstones of the Strathlethan Formation, which have been eroded back to form Strathlethan Bay. Return to the quarry at the foot of the cliff at Downie Point and examine the base of the conglomerate which can be seen to be remarkably sharply defined. The conglomerate has in fact eroded the sandstones and tuffaceous sandstones of the underlying Carron Formation at the top of the Stonehaven Group. Associated with the tuffaceous sandstones are bands of 'volcanic conglomerate' (Campbell, 1913) in which the pebbles consist predominantly of volcanic rocks, here various acid lavas. In the next quarry to the west cross-bedded red sandstones, at one time worked for building stone, are cut by a 12 m thick late-Carboniferous quartz-dolerite dyke running along the strike. This is cut by calcite veins and is deeply weathered at the margins. It can also be examined on the beach. If time is available sandstones of the Carron Formation can be examined on the north side of the harbour. These vertical, often massive, brown-weathering, cross-bedded, micaceous sandstones with thin quartzite-pebble beds strike NE–SW and extend along the shore to the mouth of the Carron Water. Take the bus through Stonehaven to the swimming pool [NO 877 865] and parking place beside the shore. Dismount and send the bus on to the lay-by [NO 886 880] 2 km N of Stonehaven. Walk along the shore to the old jetty at Cowie Harbour and follow this out to its seaward end and beyond. There at moderately low tide the highest beds of the Cowie Formation are exposed, namely tuffs and tuffaceous sandstones that overlie the Dictyocaris Member. The latter comprises pale grey micaceous siltstones in a series of red, green and purple ripple-marked sandstones. The relatively rare Dictyocaris is to be found in the siltstones and the Cowie Harbour Fish Band lies near the base. The rare fauna, including Hughmilleria, Kampecaris, Pterygotus, Hemiteleaspis, Pterolepis? and Traquairaspis, indicates a Downtonian or Pridoli (late Silurian) age (Friend and Williams 1978, p. 19). Throughout this shore section the beds dip steeply south-east, or are vertical, and strike northeast. A few metres from the end of the jetty a prominent trench about 10 m wide running along the strike marks the outcrop of a rather soft tuff band cut by a number of small faults. These can best be examined by following a 5 cm band of bright green, chloritic sandstone 2 m below the base of the tuff band. This shows repeated displacements of 1–2 m over a considerable distance along the strike. Just below this sandstone lies a volcanic conglomerate 9 m thick and containing pebbles of andesite and more acid lavas. This conglomerate is underlain by a series of brown-weathering sandstones which continue to the top of the beach. Cowie Harbour to the north-east of the jetty lies on the line of a major tear fault across which correlation has not been established. For the next 450 m along HWM the rocks consist of cross-bedded, brown-weathering, micaceous, grey sandstones showing a number of sedimentary structures which include slumping, mud flakes up to 30 cm across and concretions. Two hundred and seventy-five metres from Cowie Harbour a large NW–SE quartz-porphyry dyke complex crosses the shore. It forms a low ridge especially near LWM and can also be traced in the cliff behind HWM at a wooden lookout pole. The dyke is irregular, has several branches and has a reddish, pitted, weathered surface. The fresh rock is pink with creamy feldspars, small micas and quartz crystals, all visible to the naked eye. The dyke has been emplaced along the line of a fault and has baked the surrounding sediment. On the south-west side of the dyke there is a swing in the strike of the beds as they approach the fault, which may imply a dextral displacement. For the next 350 m to the point at Castle of Cowie, the rocks of the Cowie Formation comprise an alternating series of limonitic weathering and tuffaceous sandstones on the one hand and red mudstones and silty beds on the other, the individual units being generally 1.5–3.0 m thick. The sandstones form ridges and show slumping, ripples and cross bedding and can occasionally be seen to erode the mudstones beneath. The latter are best exposed in the cliff and show sand-filled mud cracks. At the point one mudstone is completely cut out by the overlying sandstone which contains numerous mud flakes. These sandstones and mudstones comprise fining-upward units and form part of a fluvial complex (Friend and Williams 1978, p. 19). In the bay beneath St Mary's Chapel there is much evidence of minor sinistral and dextral tear faulting, most clearly seen where the faults cross the alternating sandy and muddy beds. The beds strike almost due east-west and the faults strike at about 30° and 110°. For 150 m beyond the point exposures are poor at HWM but thereafter it is noticeable that the higher part of the beach has been levelled more than the lower part of the beach. This is because the volcanics of the Highland Border Complex which form the higher part of the beach are more susceptible to erosion than the Old Red Sandstone rocks lower down. The latter can be seen low on the shore but are better exposed in the cliffs of Slug Head to the east where both they and the underlying volcanics are stained a deep hematitic red colour. The fault rock of the Highland Boundary Fault can be seen high on the cliff on the north side of the bay. It is buff-yellow in colour and thus contrasts strongly with the colour of the volcanics. The fault running north-east across the bay beneath St Mary's Chapel cuts the cliff 30 m west of the first point of Slug Head. To the east the basal beds of the Old Red Sandstone Cowie Formation can be seen both in the cliff and on the shore. They include breccias, containing lava fragments from the Highland Border Complex up to 5 cm across, interbedded with siltstones and sandstones. The breccias become less numerous upward in the succession and disappear altogether 75 m above the base. Minor faulting is common and the rocks have been considerably sheared, so much so that the lavas in particular are difficult to identify. When fresh lava can be obtained it is seen to be fine grained, greenish-grey in colour and rather crumbly. Henderson and Robertson (1982, p. 435) stated that the lava chemistry is that of spilitic basalt, i.e. enriched in Na2O. At Slug Head the unconformity between the Cowie Formation at the base of the Old Red Sandstone and the Highland Border Complex can be seen, but it is difficult to follow in detail. The Old Red Sandstone rocks form a series of pinnacles and crags striking out to sea and dipping south at about 70°. The contact between them and the underlying volcanics lies at the base of the pinnacles and in the cliff behind. The volcanics have an apparent dip to the north-west, but this is probably due to shear planes parallel to the plane of the main Highland Boundary Fault which lies about 100 m to the northwest. Poorly developed pillows are to be seen in a small bay north of that in which the unconformity occurs. They have been affected by shearing adjacent to the Highland Boundary Fault. Near LWM better pillows up to 1 m long are displayed and have clear outlines (Trewin et al. 1987, p. 272). They should not be hammered. More commonly the lava is crushed and sheared and has largely been converted to chlorite schist, hence the term greenstone, often applied to the rock. The lavas are continuously exposed on the shore as far as Ruthery Head. Small wedges of black siliceous shales, red jasper and chert also occur, along with stringers of the fault rock described below. On the north side of Ruthery Head the fault rock crops out on the beach among lava blocks and boulders. It is a dolomitic and siliceous carbonate, yellow-buff in colour both in fresh and weathered specimens and has a streaky appearance. It is cut by numerous carbonate veins and is believed to be a highly altered serpentine now lying in the line of the fault. Exposures of the fault rock, the volcanics and the associated shales are much better on the north-east side of Craigeven Bay, the large mass of fault rock there being clearly visible from the south-west side. It is 12 m thick, has a sharp 70° north-west-dipping contact with the Dalradian rocks, but a rather diffuse contact with the rocks of the Highland Border Complex on its south-east side. 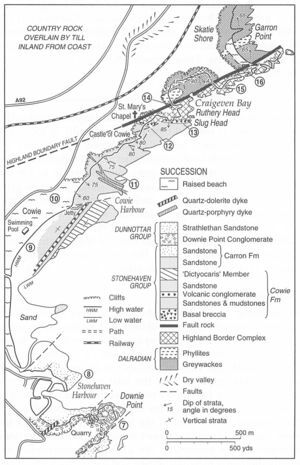 Walk round Craigeven Bay, crossing over Dalradian grits and phyllites of the Southern Highland Group, to the north-east side and cross the thick fault rock. In the small bay 30 m to the south-east the strata dip north-west at about 70°, the cleavage and bedding being coincident. Black shales, some of them pyritous and cherty, can be seen interbedded with the volcanics. Individual beds of shale are up to 60 cm thick. Similar beds nearby have yielded inarticulate brachiopods and other fossils indicating an Ordovician age for the shales and associated volcanics (Curry et al. 1984). Further exposures of the volcanics, in a schistose condition and cut by carbonate veins, can be seen by returning to Craigeven Bay and climbing up past an old coastguard but to Garron Point. Many stringers and veins of carbonate cut the volcanics. To the north-west on the Skatie Shore Dalradian rocks are well exposed. A detailed account of these and the section to the north can be obtained in Trewin et al. (1987). Return to the road by walking 450 m north along the Skatie Shore to the Den of Cowie, a prominent dry valley spanned by a railway viaduct. Walk up this valley and continue to the road by a footpath which passes under the most northerly arch of the viaduct. The lay-by is 200 m to the south-west towards Stonehaven. The dry valley, occupied by the road, is a glacial overflow channel leading in from the sea at 55 m and running out again to the north at 30 m OD. According to Bremner (1925, p. 36) it was cut by melt water from the sea ice during the retreat of the last major Quaternary ice sheet. Return to St Andrews by driving back down into Stonehaven; from the lay-by there is no access to the A90 to the north. From Stonehaven take the A90 to Dundee. ARMSTRONG M., PATERSON, I.B., and BROWNE, M.A.E., 1985. 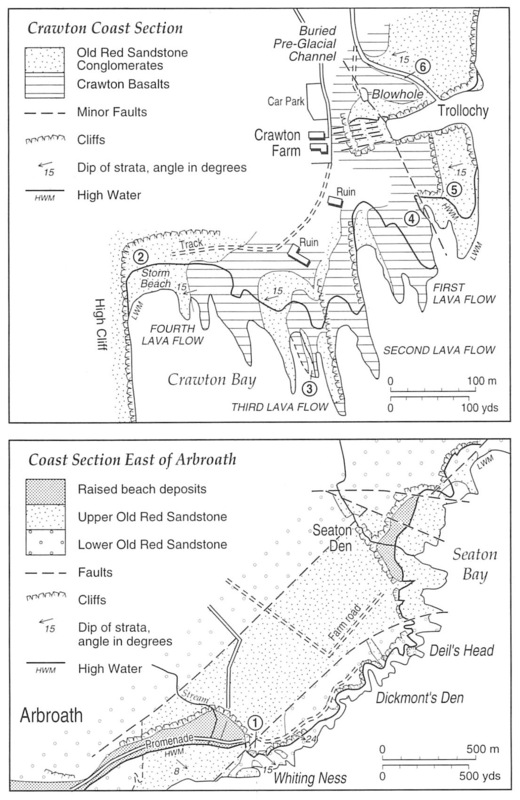 Geology of the Perth and Dundee district. Mem. Br. Geol. Surv. Sheets 48W, 48E, 49. BREMNER, A., 1925. The glacial geology of the Stonehaven district. Trans. Edinb. Geol. Soc. 11, 25–41. CAMPBELL, R., 1913. The geology of southeastern Kincardineshire. Trans. Roy. Soc. Edinb. 48, 923–60. CURRY, G.B. et al., 1984. Age, evolution and tectonic history of the Highland Border Complex, Scotland. Trans. Roy. Soc. Edinb. : Earth Sciences 75, 113–33. FRIEND, P.F. and WILLIAMS B.P.J., 1978. 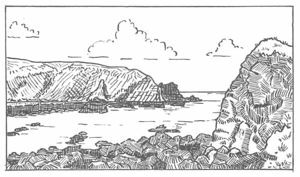 A field guide to selected outcrop areas of the Devonian of Scotland, the Welsh Borderland and South Wales. Palaeont. Assoc. International Symposium on the Devonian system. HAUGHTON, P.W.D., 1988. A cryptic Caledonian flysch terrane in Scotland. Jour. Geol. Soc. Lond. 145, 685–703. RAMOS, A. and FRIEND, P.F., 1982. Upper Old Red Sandstone sedimentation near the unconformity at Arbroath. Scot. Jour. Geol. 18, 297–315. TREWIN, N.H., KNELLER, B.C. and GILLEN, C. (Eds. ), 1987. 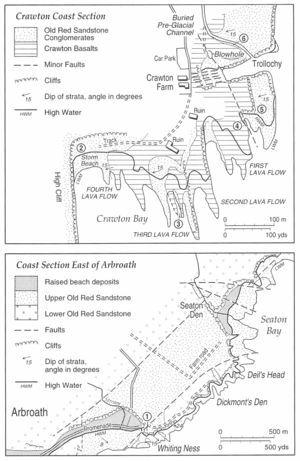 Excursion guide to the geology of the Aberdeen area. Scottish Academic Press, Edinburgh. This page was last modified on 22 February 2019, at 23:26.